On Thursday, September 15, Beat the Streets Wrestling™ held our fall fundraiser Tailgate & Tonics at the Ainsworth in Midtown. 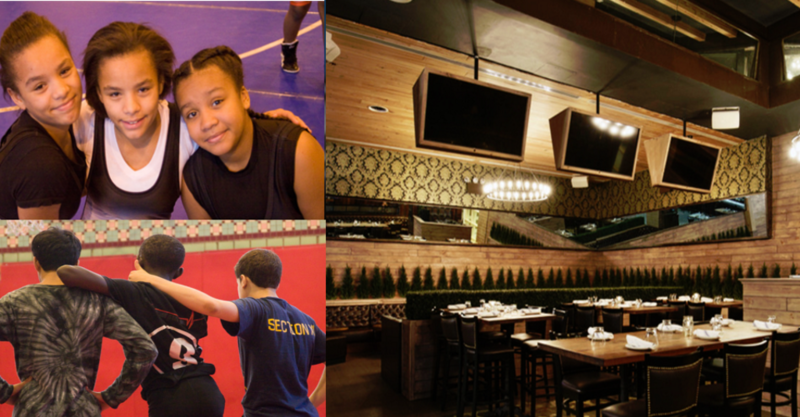 Over seventy patrons of wrestling attended this fundraiser to benefit the BTS Junior League, which kicked off the city’s largest middle school wrestling program that same day. The event raised over $9,000 to keep bringing the joy of wrestling to more kids in New York City. The atmosphere was boisterous, with the Ainsworth’s loud dance music setting an energetic tone for the night. The lively, sometimes uproarious conduct of these veteran wrestlers drew some curious onlookers from the throngs of bar-hoppers who were out in the early evening. Ryan Abbott, a member of the BTS Leadership Council, spent the evening managing the 50-50 raffle. While other attendees relaxed, he was busy hustling more and more people into playing, even winning the participation of some non-wrestlers who were intrigued and persuaded by his salesmanship. When it came time for the raffle drawing, the lucky winner was a Mr. Albert Kirchner. Kirchner demonstrated a magnanimous spirit and a true passion for helping NYC’s youth when he immediately donated his $300 in winnings back to the organization. “It’s a great gang and I’m glad they’re doing it for the kids,” Kirchner said.